(CBS News) DANVILLE, Va. -- Vice President Joe Biden on Tuesday told a diverse crowd here, including many African-Americans, that presumptive Republican nominee Mitt Romney would "put you all back in chains" by unshackling Wall Street. Biden told more than 800 ticketed supporters that Romney wants to repeal the financial regulations enacted after the Wall Street crash of 2008. "He's going to let the big banks once again write their own rules - unchain Wall Street!" Biden said. Then he added, "They're going to put you all back in chains" with their economic and regulatory policies. Romney spokeswoman Andrea Saul said Biden's comments "are not acceptable in our political discourse and demonstrate yet again that the Obama campaign will say and do anything to win this election. 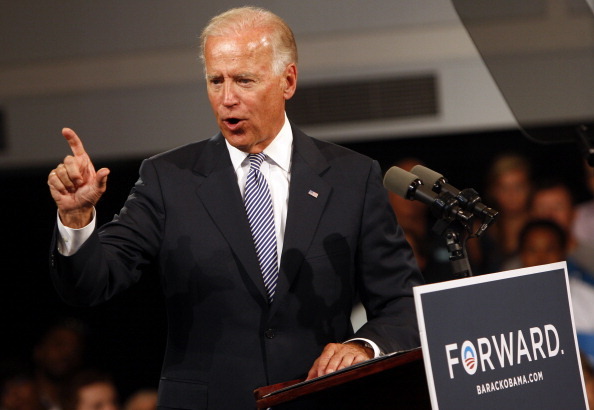 President Obama should tell the American people whether he agrees with Joe Biden's comments." Stephanie Cutter, deputy campaign manager of the Obama campaign, called Saul's statement "faux outrage. She said on MSNBC that Biden was "using a metaphor to talk about what's going to happen" if Romney is elected and financial reform is repealed. and "we have no problem with those comments" in their full context. The Obama campaign later put out a statement that said Biden's comment was a variation on comments Republicans have made about unshackling the private sector, and his own frequent references to the need to unshackle the middle class. "Today's comments were a derivative of those remarks, describing the devastating impact letting Wall Street write its own rules again would have on middle class families," the campaign said. Biden is on a southern swing to North Carolina and Virginia this week. "With you we can win North Carolina," he said at the end of his speech, mistakenly referring to the bordering battleground state that he visited on Monday. In the past month polls of Virginia have ranged from a tie to Obama ahead by 4 percentage points, within the poll's margin of error. North Carolina is also a toss-up. Rodney Hawkins covers the 2012 presidential campaign for CBS News and National Journal.